Feel the expression of playing on full-sized keys, but in a compact sized controller that will easily integrate into any desktop production setup. Introducing the V61 Keyboard Controller with 61 full-sized, square-front keys, 8 LED backlit touchpads with velocity and pressure sensitivity, 4 assignable knobs and 4 assignable buttons, pitch and mod wheels with expressive control and seamless visual feedback from the illuminated buttons and knobs. The V61 is everything you need in a keyboard controller, without the space and size of some much larger, feature enhanced versions. 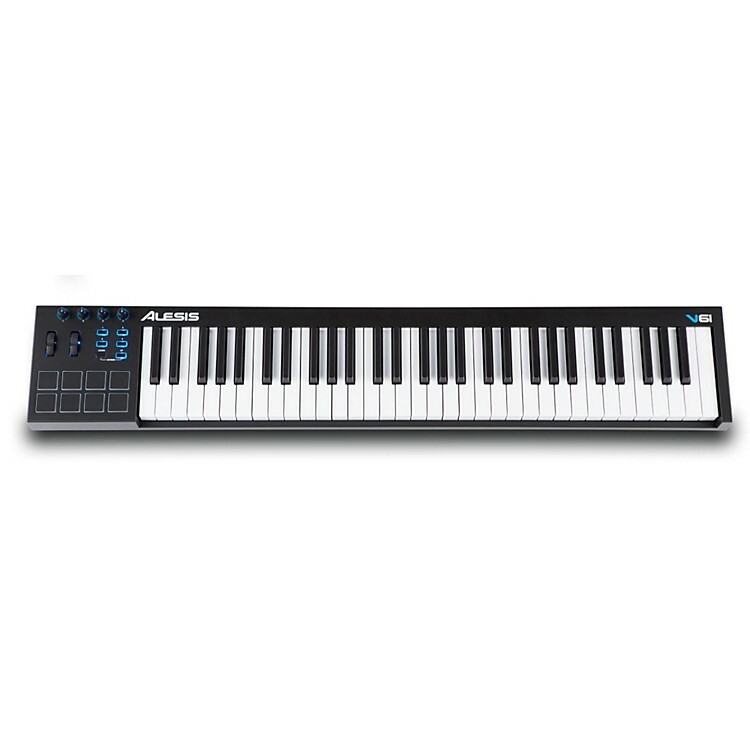 The Alesis V Series adds dynamic expression to your virtual instruments. Cool blue LEDs illuminate the pads-as well as the four assignable knobs and buttons-for positive visibility. Assignments may be made quickly via the MIDI Learn feature. Octave shift keys provide access to the entire note range. A single USB cable provides both a power and data connection to nearly any computer. Get the feeling you crave, in a size that fits. Order today!